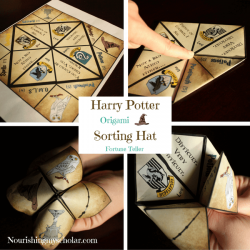 When a little boy has a love of Harry Potter, you find that he wants everything to have a Harry Potter theme. This spills over into Christmas as well! 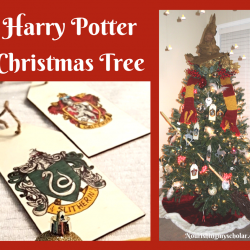 Last year we created a Harry Potter Christmas Tree and a Hogwarts Gingerbread Castle. 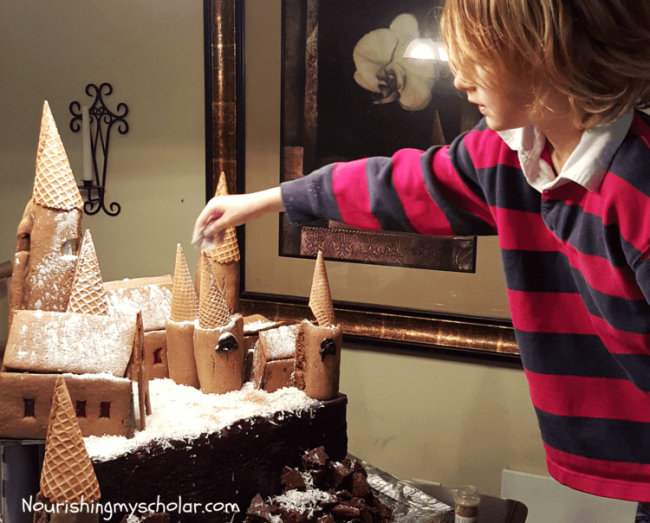 His Papa and I helped him with some of the harder to make towers and rolling out of the gingerbread, but the majority of the work was done by our 9-year-old son. He was so pleased with the results of his hard work. 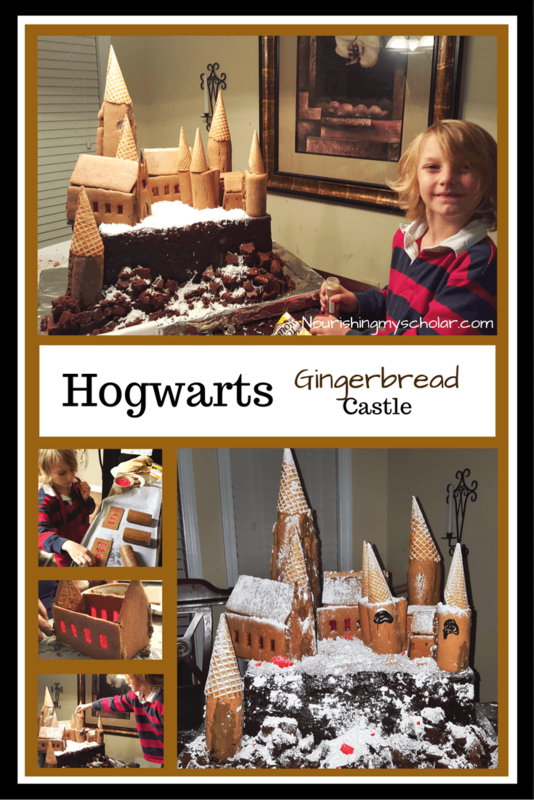 His Hogwarts Gingerbread Castle was quite epic. 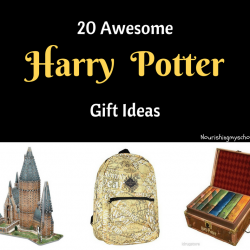 I researched Hogwarts Gingerbread Castles and found a blog post on Not Quite Nigella and her Hogwarts Castle made of Gingerbread. Her Gingerbread Castle is gorgeous! Do pop over and check it out. Our son set to work finding boxes, toilet paper rolls, and paper towel rolls for his castle. He got two pieces of foam board for the very base and covered them with aluminum foil. 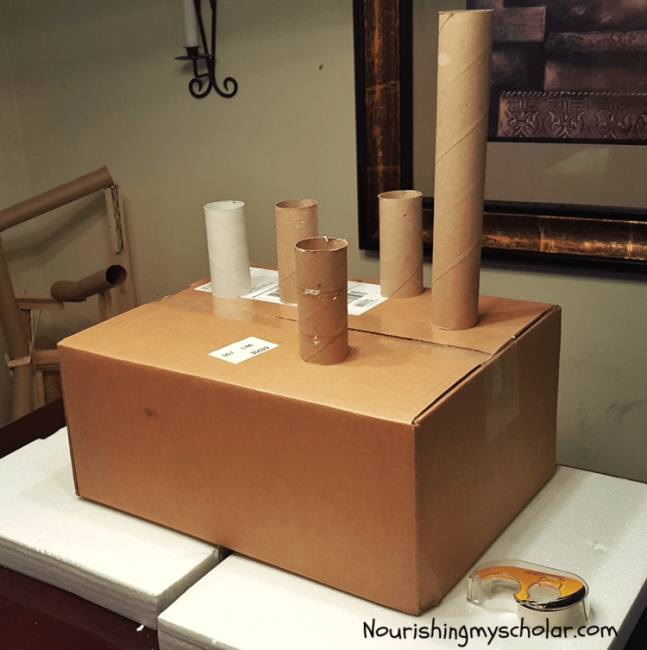 Our son placed the paper rolls on a larger box where he thought his towers should go. 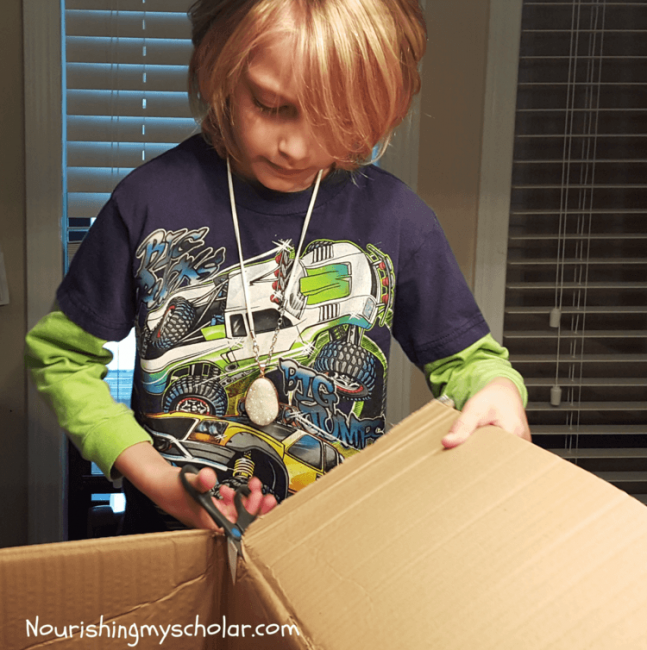 He cut open the bottom of the box so that it would sit flat on the table. Then he drew on top of the box where he wanted his buildings. Then he measured those markings so that he would know how big to make those pieces of gingerbread. 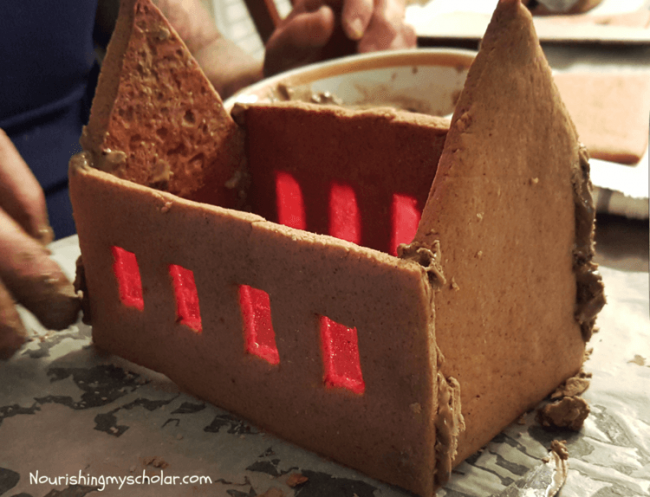 We set to work making our gingerbread. He helped me with the measuring, mixing, and rolling out of the dough. We wrapped out toilet paper rolls and paper towel roll in aluminum foil. 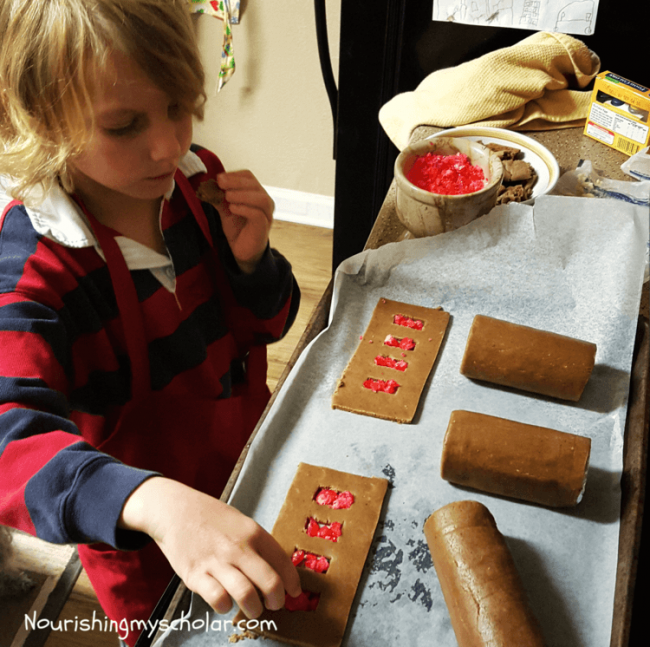 Wrapping the rolls in our flattened gingerbread was one of the hardest parts about making the gingerbread. This is because you had to get the gingerbread super thin but at the same time thick enough to not crack and break….it took us several tries and a whole batch of dough before we got it right. We cut little rectangular windows in the side pieces for our Great Hall. Our son crushed some red Jolly Rangers and filled the windows with them. In the oven, these candy pieces melted beautifully to look like red glass! After all of our building pieces had cooked and cooled we made some royal icing to cement them together. Our son colored it brown by adding cocoa powder and then he set to work making his Hogwarts Castle. We covered our box on the table with black construction paper and then a layer of chocolate frosting. Chocolate cake was made and then crumpled it in front of our box to look like the cliffs around Hogwarts. Our son used Ice Cream Cones as the roofs for his towers. He used a bit of chocolate icing to outline a few of his tower windows. Then he sprinkled the whole creation with powdered sugar and coconut shavings. Talk about one happy little boy. 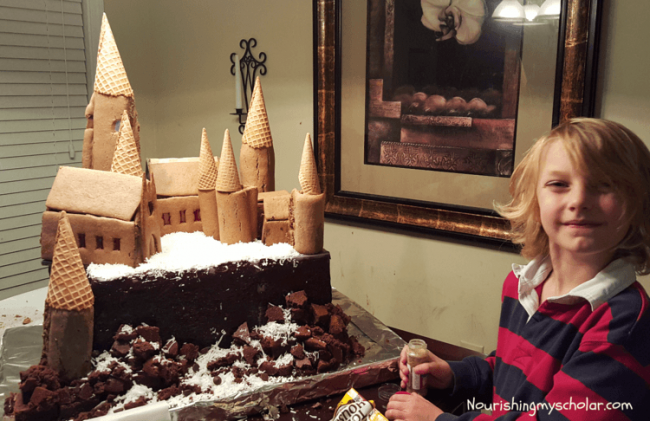 His Hogwarts Gingerbread Castle was as tasty as it was awesome! 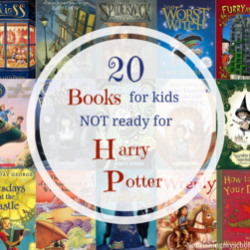 Check out these Harry Potter resources!